What was art in the Middle Ages? Architecture was certainly a type of art. There was quite a bit of religious art emanating from patronage. Secular art continued as well and also developed again in a later medieval context. 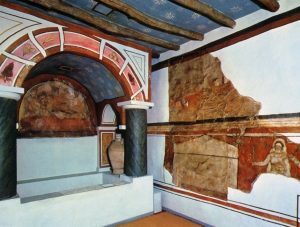 Architecture, painting on panels or walls (fresco), metalwork, mosaics, stained glass, manuscripts, jewelry, and more were all types of artistic mediums at the time. One issue in art history has been an ongoing battle to accept that small-scale pieces also qualified as important art, such as jewelry. 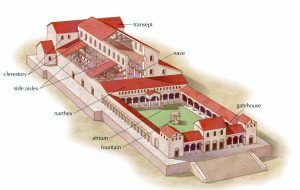 Late antiquity was the period of the late Roman Empire when Christianity was emerging. We use a calendar today based on the life of Jesus, which has been since the Middle Ages BC (Before Christ) and AD (Anno Domini). However, this has changed largely to BCE (Before Common Era) and CE (Common Era). Here I focus on the beginning and development of Christianity and Christian art and architecture. 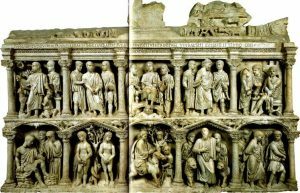 There is a difference between the Christian art of the first through third centuries and that which developed afterward (after the Edict of Milan – a.k.a. Edict of Toleration – under Constantine in 313 CE) until 520 CE. This later period saw the destruction of Rome and a split in the Church. Earlier Christians who were martyred were killed for refusing to give up their faith and follow Roman practices. 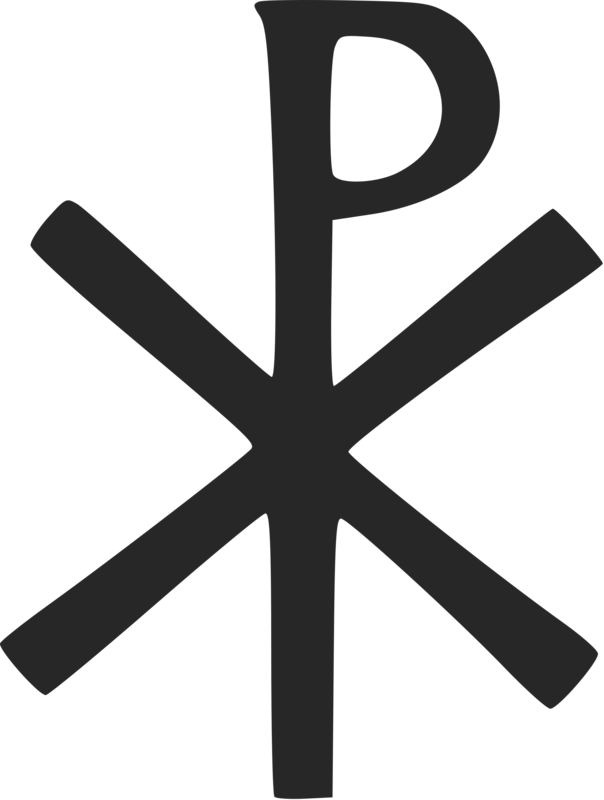 The Edict allowed the legal practice of Christianity in the Roman Empire. In 324 CE, Constantine moved the capital of the Roman Empire from Rome to Constantinople (modern Istanbul, Turkey). He felt his presence in the East would help to re-coagulate the Empire amidst upheaval in that region, and it ended up being the first to split. 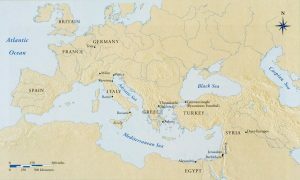 The Roman Empire split between East and West under separate emperors in 394 CE. 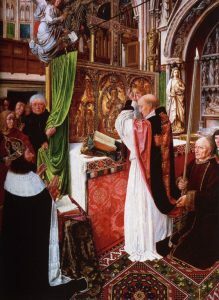 The image above (right) shows an altarpiece with the priest separated from the people and raising the Eucharist. Christianity was becoming stronger, and the increasing power of the Church assisted with the weakening of the Roman Empire. The poor were by far most of the earliest converts to Christianity. The rich had everything they wanted and needed here on Earth, but the poor were now offered this promise of eternal paradise. This was a multicultural period. Art was made for both Christians and Pagans. We don’t know the religious beliefs of the artists – they simply worked for those who paid them and produced what they were asked to produce (patronage). The piece on the left is Adam naming the animals, clearly Christian. The piece on the right is a Pagan priestess performing some type of ritual an altar, carved in three-dimensional perspective. Both pieces used Roman techniques. We see the body being classicized here. We call this period antiquity, which references the ancient Roman and Greek world. 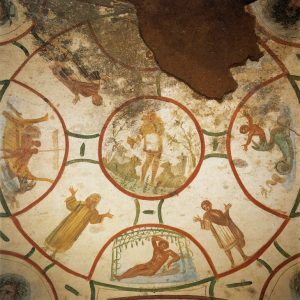 Classicizing indicates that Roman and Greek artistic techniques were being copied by medieval artists, but they were not doing exactly the same things. The Eucharist (communion) represents the blood and body of Christ. Early Christians considered this to be a literal consumption, thus taking Christ’s body “into” oneself (transubstantiation). Both fasting and the taking in of food came to symbolize many things in medieval times, such as with mystics. This is the plan (left) and section (right) of a catacomb. 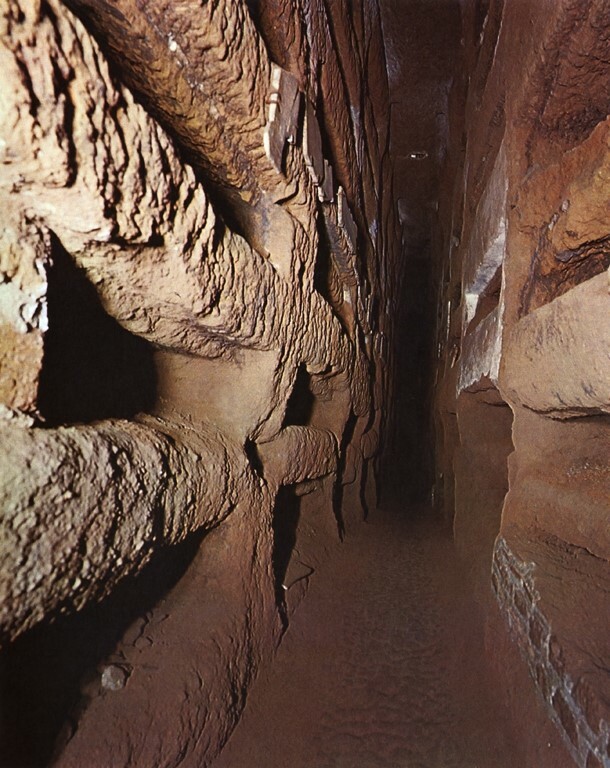 Catacombs were used in the early Christian world but were no longer used after legalization of the religion. 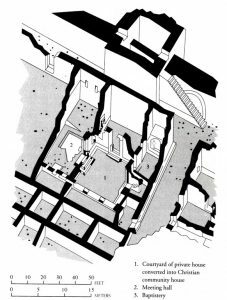 Catacombs were not very elegant – bodies were placed on concrete/stone shelves, often a whole family on the same shelf over time. Catacombs tell us about the poverty of early converts as well as their belief in burying the whole body. They could construct things such as this (and later larger structures) because they collectively amassed more wealth and power in spite of individual poverty. Later, with widespread conversion, the rich began to contribute in many grand ways as well. 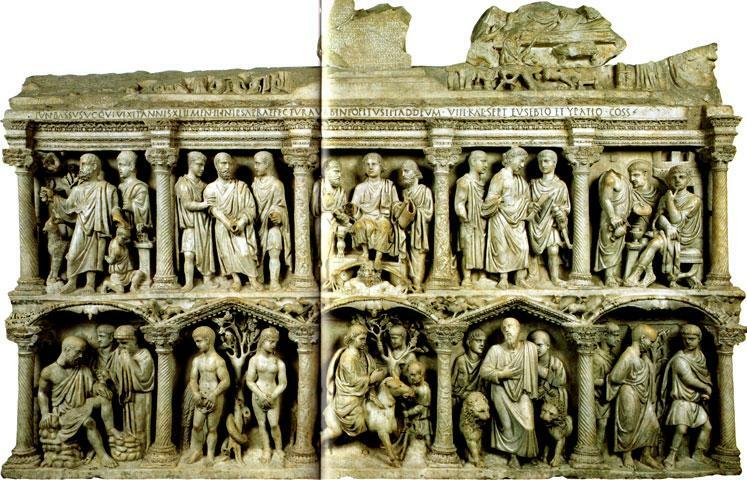 But early on the poor could not afford to highly decorate catacomb shelves. There were iconographic themes in what catacomb art there was. We can see the domed ceiling here in a small catacomb chamber. Many figures are represented praying, and there were Biblical scenes portrayed as well (Last Supper, Jonah and the Whale, etc.). This catacomb of Saints Peter and Marcellus dates to fourth century Rome. They would “eat with the dead” in funeral banquets in these chambers and celebrate the Eucharist as well. To eat where the dead were buried was an old Pagan tradition in which the food was “shared” with the deceased. Transubstantiation likely springs from this notion – “eating” with the dead and taking in the body/blood of Christ. 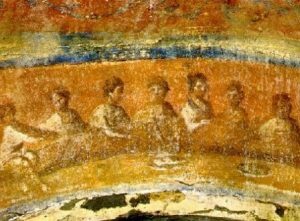 The center image in a catacomb represents the Last Supper. 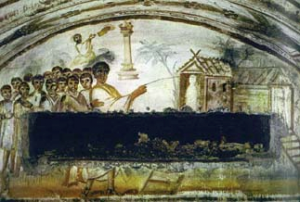 Themes of death and rebirth were common, such as the depiction on the far right of the raising of Lazarus (catacomb via Latina, Rome mid-fourth century CE). Jonah was consumed by a whale and “reborn.” Biblical subjects in catacombs were normally those dealing with death and resurrection based on Christian belief. There were Pagan sources of motif and style in early Christian art. 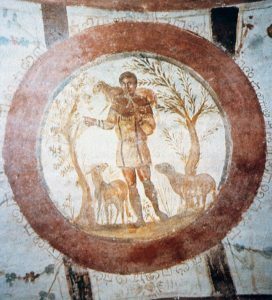 Christ was understood to be the “good shepherd.” Here is a young herdsman with his sheep. Here it is used metaphorically as Christ leading his flock. This could easily have been a Pagan shepherd boy and was in fact a common Pagan motif. Early Christians would be familiar with Pagan practices, theology and art. The stance is contrapposto – one leg straight and the other bent slightly at the knee. It is a relaxed posture and was invented by the Greeks to show weight distribution for a more natural look in their art. Modeling (building up tone from light to dark or dark to light to suggest three dimensions) is also used here, again borrowed from Roman art. 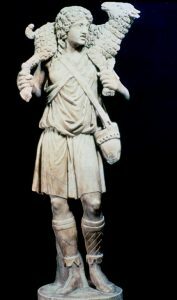 The average look (the shepherd) became the new classicized ideal in Christian art as opposed to Greek and Roman ideals. Early Christians couldn’t afford to hire the most noted artists of their day who were well-versed in it. 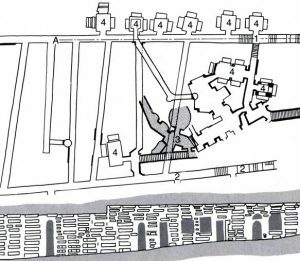 Also, the artists that they hired did not want to work slowly and in painstaking detail in the catacombs with bodies – they were more hurried and sketchy in their work. 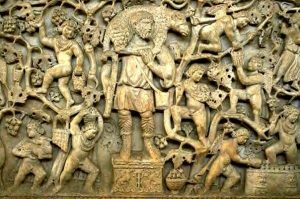 Non-Christian Romans were customarily scared to be around the dead. Painterly brushwork is used here in tandem with contrapposto and modeling. Romans were looking for ways to capture the way things really worked and looked, but Christians believed that the only thing of import was the human soul. They did not heavily emphasis physical realism. The shepherd motif was widespread in both Christian and Pagan art. Christians found meaning in the familiar Pagan theme of a sheep wrapped around the shepherd’s shoulders. You often find layered meanings in medieval art, even multiple meanings for the same piece. The lamb was closely identified with Christ because he was the “lamb of God” as the sacrifice for all sin. They were often used as sacrificial animals. The Good Shepherd Sarcophagus above (Rome, late-third century) shows such widespread use across both Pagan and Christian practices. 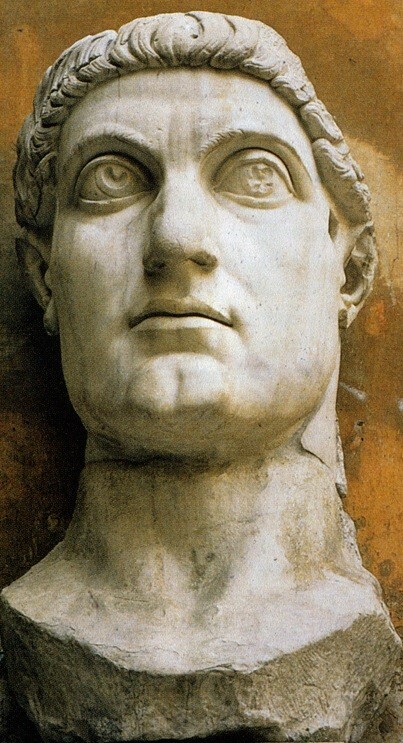 The statue of Constantine was colossal in size. Remember, he moved the Roman Empire’s capital to Constantinople. He had a vision of the cross (Chi-Rho) and heard a voice saying that under that sign he would win a battle – and he did. His mother and daughter had already converted by that time, though he had not yet converted and whether he ever truly did or not is in dispute. He was a smart politician and this was an ingenious way to match the changing times and shifting power base with the emerging growing power of the Christian Church. He proclaimed the Edict of Milan (Edict of Toleration) in 313 CE to legalize Christian practice. 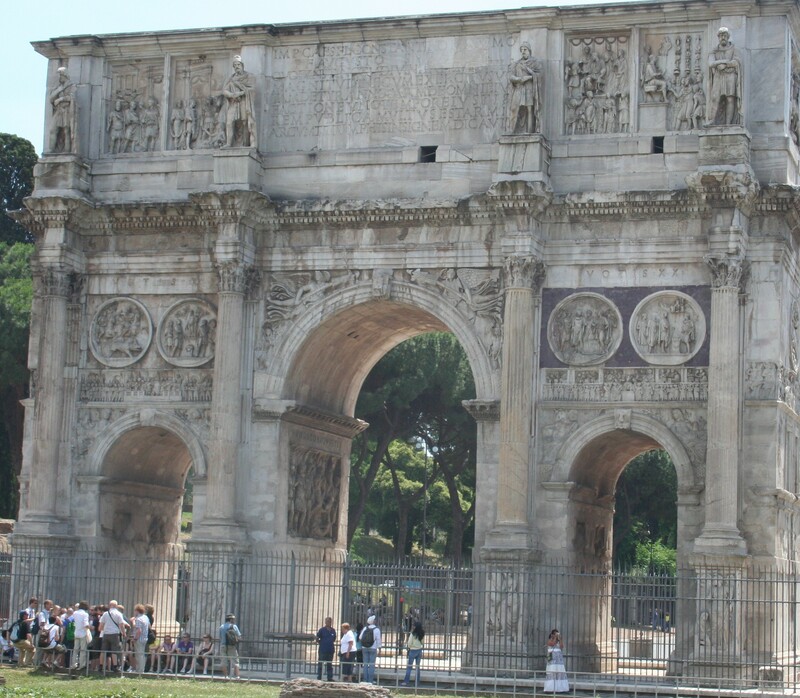 Constantine’s triumphal arch was erected to celebrate his victory over his rival Maximus. 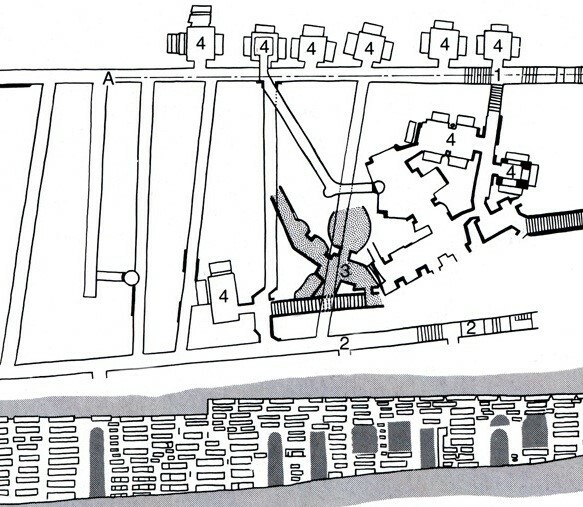 Spolia is the reuse/repurposing of materials/styles/ideas from other works. 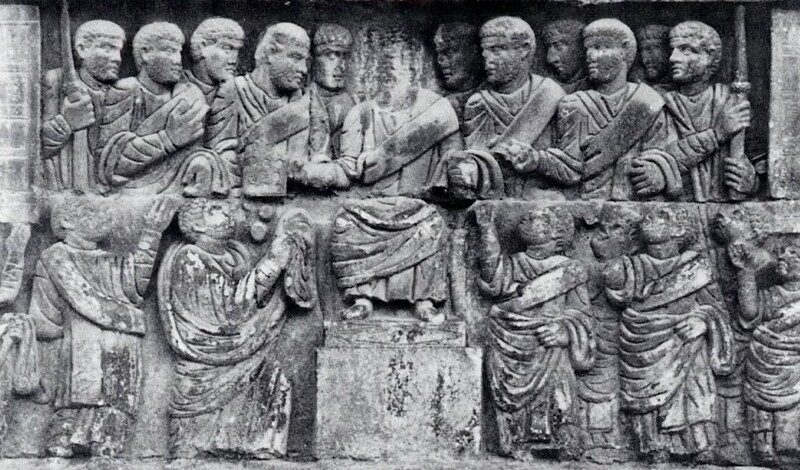 The figure on the right is Constantine giving charity. He appropriated this idea from the same type of image used for Marcus Aurelius on the left also giving charity. He wanted to be thought of in the company of those such as Aurelius – those emperors who had been beloved. The monument of Aurelius is more classicizing (realistic), with three-dimensional representations and techniques such as draped clothing following the body’s contour to show and emphasize its three-dimensionality. That of Constantine on the right is a more flattened frontal view with less attention paid to realistic physical representation. Proportions were much less realistic, such as huge heads on short, small bodies. Both being the same subject makes it simpler for us to compare the composition (arrangement of figures and elements). Think about the positioning of Aurelius and Constantine and those around them. 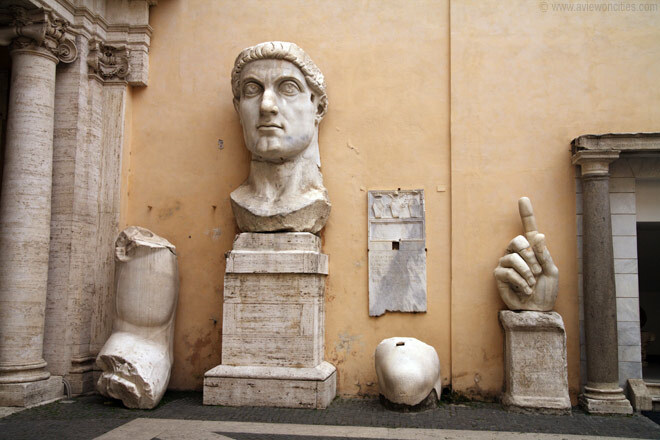 Constantine’s is a much more symmetrical composition with all figures uniformly looking at him raised on a pedestal. 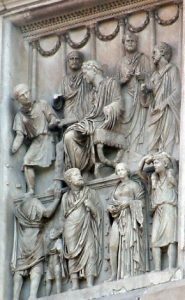 Aurelius is seated with the other figures appearing much more natural and asymmetric, some looking at him and some not. Both are centered, but Aurelius is turned and movement and variety are more enhanced in his composition. There is a difference between naturalistic (accurate representation) and realistic (exactly as things appeared). 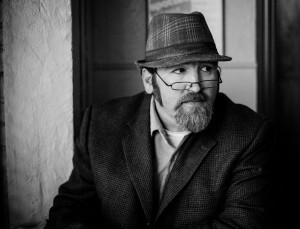 Constantine would want such an unnatural physical representation to connect with the Christian thinking of the time – that the spiritual and Heavenly were more important than the physical and Earthly. 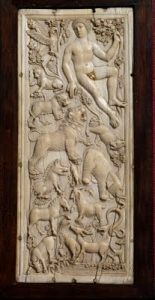 This had to have been a choice because this was a commission by the emperor himself – there was no lack of money as there had been with early Christians in the art they could commission. 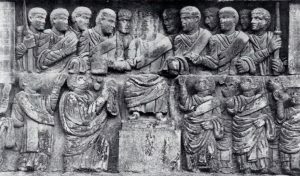 This is a direct representation of Christian influence in a departure from classical veristic Roman artistic techniques – ideas were more important to convey than realistic depictions.